Though it may be tempting to create a romantic Polish culinary past, of rolling hills and agroturismo homesteads where kindly ladies bustle about kitchens making pierogi, nothing could be more representative of Polish cuisine than the humble milk bar. Here we can find borsch, żurek and potato pancakes, cucumber salad and cold beetroot soup – as well as beef roulades with pocked Silesian dumplings that collect brown sauce in their wells. Nothing could be more evocative. For a long time, though, milk bars in Poland were for many people nothing more than a depressing communist throwback – tiny, poorly-ventilated canteens where everyone stood around in queues, waiting for orders at the mercy of brusque lunch ladies. Though they emerged in the 19th century as restaurants where people could get dairy-based meals (whence the name), it was a nationalising scheme by the communist government that brought their numbers into the dozens of thousands – thus cementing their significance in the popular consciousness. Pan Marek with his meal of pig knuckle, potatoes and cabbage. After 'the transformation' in 1989, and Poland’s entry into the free market, milk bars began to disappear from the urban and social landscape, as successive governments cut back the subsidies that helped keep them afloat. Nor could they compete with the market spoils of services and amenities. In a world of new fast food options and flashy fine dining, navigating the dishes on the changeable letter boards – which could often run out as fast as a lunch lady's patience – was a rather grim affair. But at Warsaw's Prasowy milk bar today 'business' is booming in a trend reversal that has seen a general revival of the old institutions. 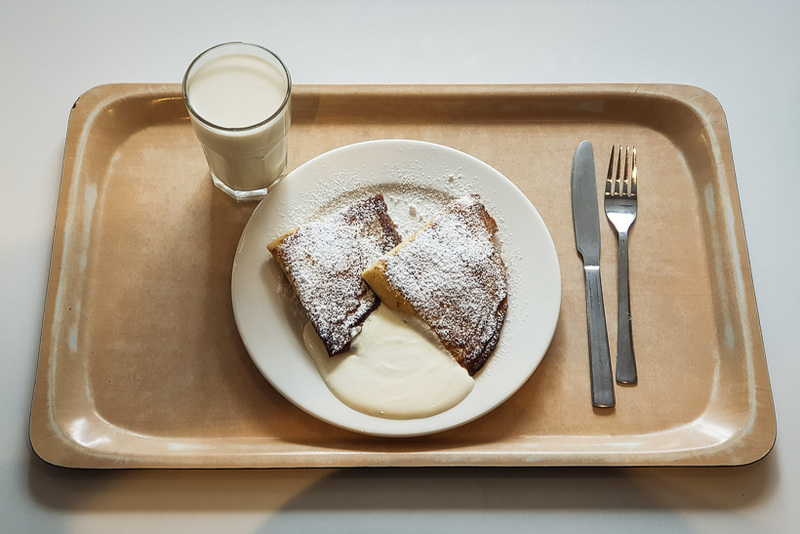 In a well-heeled part of town, the newly-refurbished canteen attracts young and old, suits from the nearby ministries, as well as the down-and-out – everybody coming together in one big magnanimous act of social leveling. Milk bars are great ‘social levelers’, attracting both young and old. Prasowy, which is celebrating 60 years this year, almost shut down before outraged residents and activists staged a sit-in that forced the municipal authorities to announce a tender for the space – with the express stipulation that it continue to function as a subsidised milk bar. A new owner came in and restyled the joint with formica tabletops and neon signs, hot on the tail of a general hipster nostalgia for a lost communist landscape. Most people, though, come for the ordinariness and familiarity of a milk bar meal. Construction workers Pan Marek and Pan Jakub (‘Pan’ or ‘Pani’ is Polish for Mr or Mrs, respectively) never had a milk bar in their tiny hometown, but they still crave home cooking, something they say milk bars do well. Milk bars offer their patrons cheap, nourishing meals. ‘I don’t come here very often, but it was easy to pop in on the way to the doctor’s,’ says Pani Hanna, a 90-year-old dressed in a smart sage two-piece. Opting for the peculiar tradition of the Polish dessert dinner – in this case, crepes with sweet cheese – she can still recall when the milk bar was the canteen for the local ‘Warsaw Life’ newspaper (‘Prasowy’ means ‘press’ in Polish), with the journalists mixing with people from all walks of life. 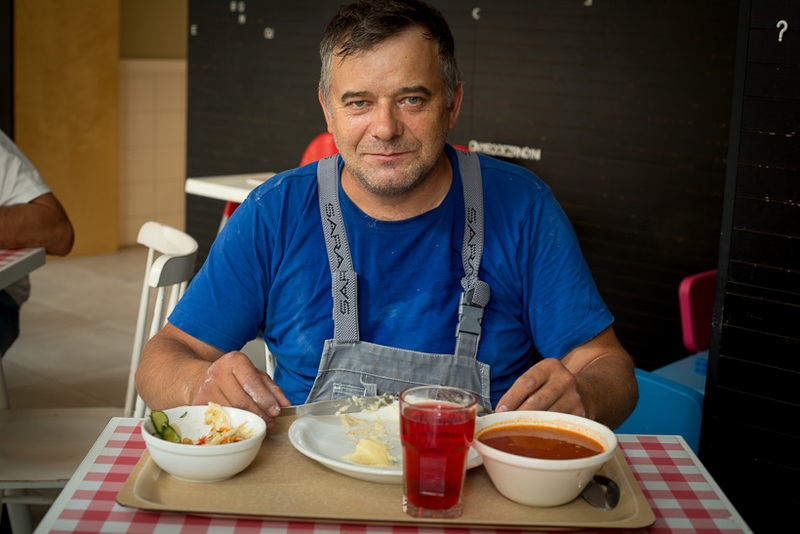 Prasowy acting-manager Pani Galina says there is little secret to its success: ‘This is where you can get good food without preservatives. And everyone can come here – young, old, famous actors, rich and poor. Often, it’s too expensive to cook at home for one – here it’s much cheaper,’ she says. 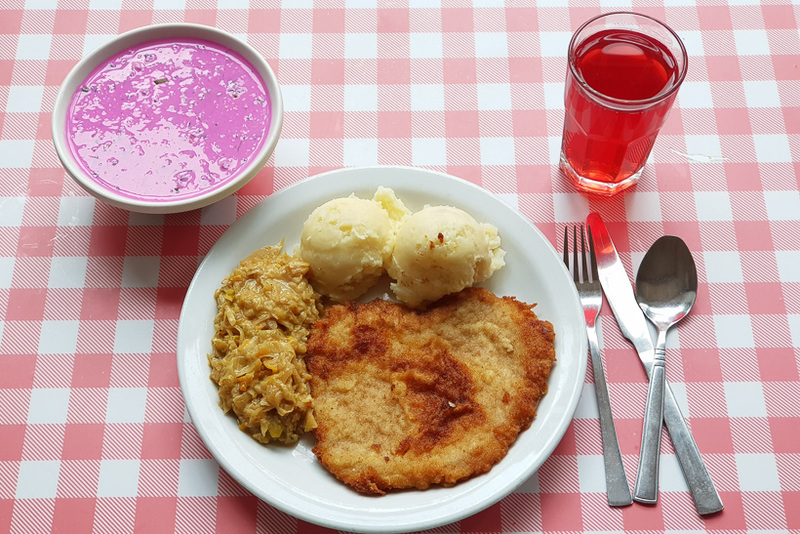 A typical Polish meal of cold beetroot soup, pork cutlet, potatoes and cabbage. A popular drink is a ‘compote’ made from crushed fruit. Prasowy’s success has, in turn, brought on a revival of other old milk bars (there are now only around 150 left in the whole country), many of which are being given a second chance. New chains have also opened, introducing their own take on bigos (hunter’s stew), broth and borsch. 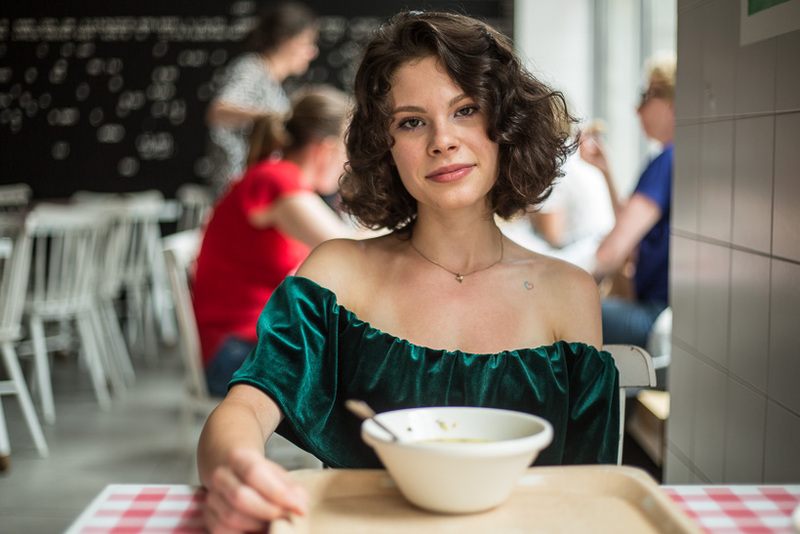 The revival has also tapped into a booming vegetarian trend (Warsaw ranks third in the world when it comes to vegetarian restaurants), with the Vegetarian Milk Bar offering its own interpretation of Polish classics. 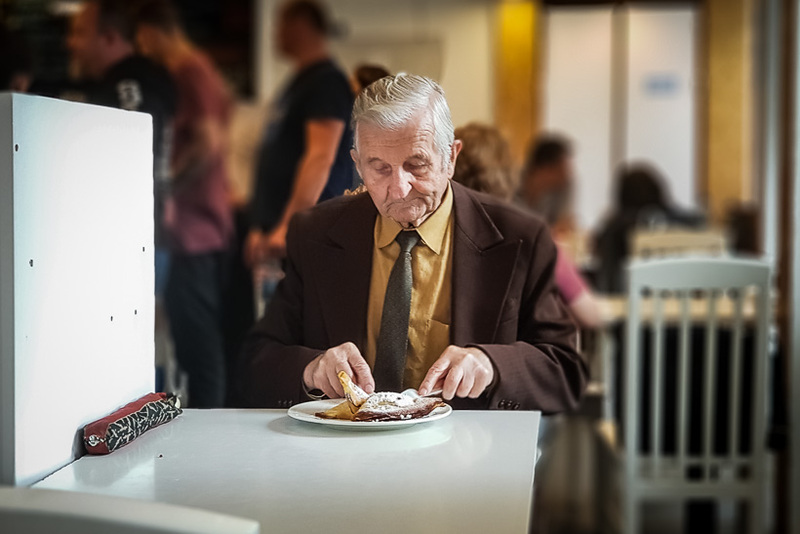 Ultimately, though, in saving the milk bar, Poles have managed to hold onto one of the last vestiges of a shrinking welfare state: that food should be accessible to all, regardless of class or income. A typical Polish dessert dinner: pancakes with sweet cheese. The milk bar looks set to stay.